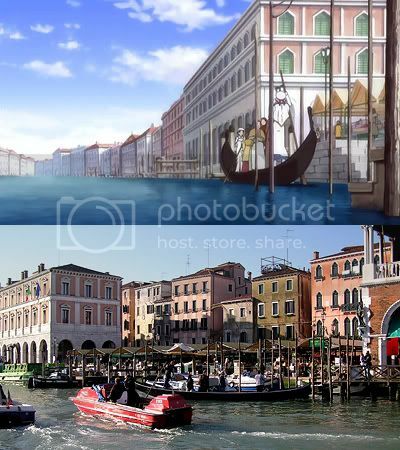 The Traghetto, as explained in ARIA is a gondola ferry service across the Grand Canal which saves time and walking since there are only three (functioning) bridges across the Canal. Now, the Gondola as we all know is an expensive but the defining icon of Venice which meant I needed to get on one, but the fact that I'm such a cheapskate didn't help the cause - but the Traghetto is the answer to that. The ride lasts only 1 minute but costs a measly €0.60 standard (my second ride elsewhere was only €0.50). It is amusing to see the "commuter rush" even in Venice, with two gondolas shuttling back and forth at some points during the morning, but the service reduced to a single gondola shuttle during the day. The Traghetto are manned by two gondeliers, wearing the same black and white striped uniform identical to that of the standard hire gondolas. 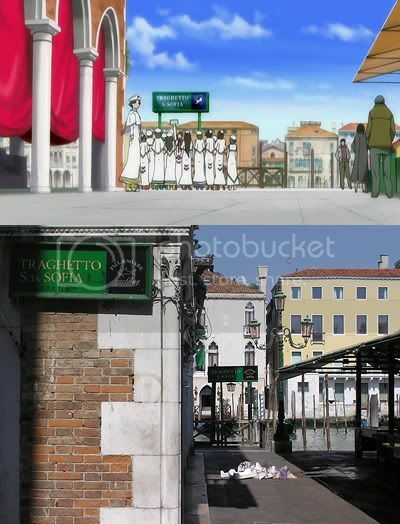 As I was wandering through Venice hours after arrival, I was on the constant lookout for Traghetto crossing points, and the first one that I came across was the very Traghetto S.Sofia which was used as a location in both ARIA the manga and anime. A very lucky encounter indeed! Unfortunately, the number of passengers was sparse at 3pm meaning I didn't get the chance to stand but it does happen during crowded trips! Enough text boredom - bring in the pictures! The approach to the South end of the Traghetto. Looking away from the Grand Canal. A view across the canal, facing North. The scene on the Grand Canal as I do the one minute crossing. 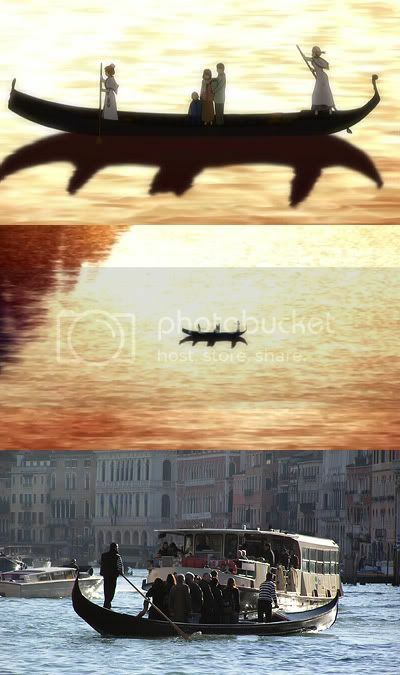 A very lucky capture from a Vaporetto 2 days later of a Gondola pulling out, much like ARIA. The Northern side of the Traghetto. This picture of mine during the morning rush was not taken at S.Sofia but it is self-explanatory. 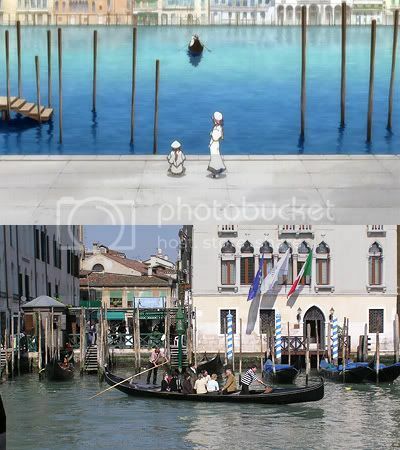 The Grand Canal really is far narrower than ARIA depicts it to be. I guess the widescreen doesn't help either! Although the Santa Sofia market was closed when I passed through for my Traghetto ride, it was in full swing 2 days later when I passed by early morning on a Vaporetto. The market is slightly out of the way of the tourist routes and I'm therefore under the impression that it would give a more "local" experience of Venice. This is where I have to go against ARIA. 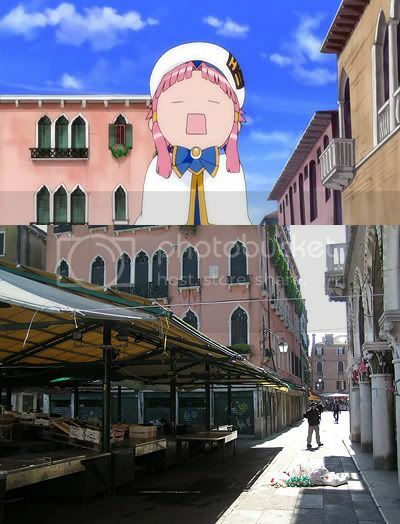 In episode 9 of the Origination, Alice described the Rialto market area as the second center of activity, aside from San Marco and has a more "local" feel. My experience of Rialto is it being packed with tourists and therefore I would recommend the fresh food market of S.Sofia instead. Great post is great, as always, thus I can't say more now. 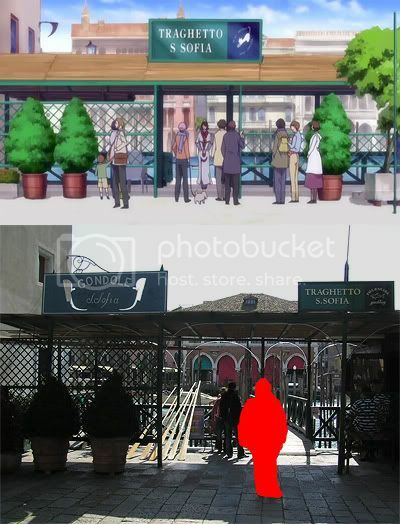 It's interesting, and it's another experience what I look forward to, when I visit Venice... some time or other. Oh, how I regret that, when I was in Venice, I was like the other lemmings... thought I was only 11 years old. 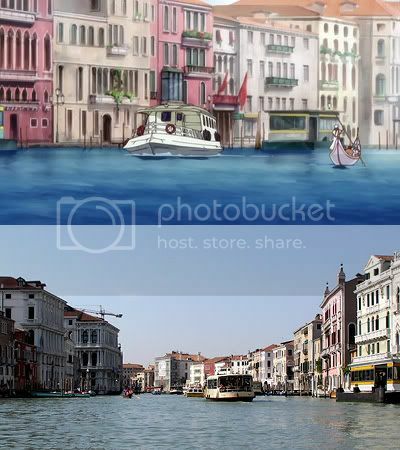 But, still, I remember when I heard the voice of the real Venice, when I saw the real Venice at the end of the day. It's carved to my memory... I never forget that.